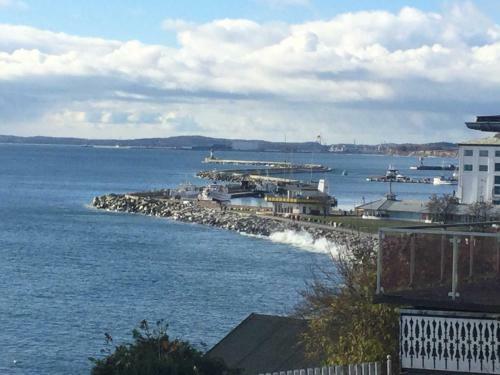 Villa Seeblick Appartment Meerfore offers accommodations in Sassnitz, 1,950 feet from Sassnitz fisheries and harbor museum. The apartment is 0.7 mi from HMS Otus. A dishwasher can be found in the kitchen. A flat-screen TV with cable channels is available. Dwasieden Castle is 1.5 mi from Villa Seeblick Appartment Meerfore, while Sassnitz ferry port is 3.7 mi from the property. The nearest airport is Heringsdorf Airport, 48 mi from the property. This is our guests' favorite part of Sassnitz, according to independent reviews. When would you like to stay at Ferienwohnung Meerforelle 207 in der Villa Seeblick? This villa features a dishwasher, CD player and DVD player. House Rules Ferienwohnung Meerforelle 207 in der Villa Seeblick takes special requests – add in the next step! We need at least 5 reviews before we can calculate a review score. If you book and review your stay, you can help Ferienwohnung Meerforelle 207 in der Villa Seeblick meet this goal.